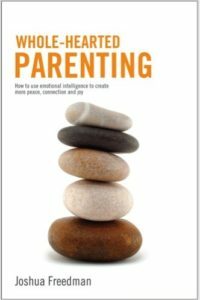 (Corralitos, CA) Six Seconds, the emotional intelligence network, announces the release of a new book on parenting with emotional intelligence. Whole Hearted Parenting: How to Use Emotional Intelligence to Create More Peace, Collaboration and Joy, by Josh Freedman, shows parents ways to connect with their children so that both parents and children find more happiness and peace in their relationships. Preview copies are available starting December 10, 2015, the publication date is January 4, 2016. Josh Freedman offers parents sane and sound advice about how to raise good kids. Whole-Hearted Parenting is a reader-friendly, no-blame, guide to parenthood that any mom or dad will find of great use – both in those trying moments when it’s not clear what to do. It is no secret; parents are more stressed out than ever before as the demands of two-parent working families, single parent working families and the complex social environments test even the steadiest of parents. Through a series of personal essays and examples, this practical and inspiring new book shows how parents can use the time-tested methods of emotional intelligence to navigate the strong emotional waters of parenthood. Josh Freedman, author and co-founder and CEO of Six Seconds, the emotional intelligence network, has written a new book about parenting from the heart. The book, Whole Hearted Parenting, comes out of Freedman’s 16 years as a parent and decades as an educator and expert in the field of emotional intelligence. Josh Freedman and his wife, Patty made a daring decision to take their two young children out of school for months at a time over a five-year period and travel to different parts of the world, from Japan to Italy to India. The results were two children who found their voices, one who became a passionate wildlife advocate, speaking in front of hundreds of people, another through his passion for caring for bees. He says in the book’s introduction, “after having ridden the roller coaster of parenting for 16 years so far, I can now say with certainty: I was an idiot.” That is his way of saying this book is less an advice manual and more of a helpful companion and friendly storyteller for parents seeking a better way to raise their children. In it, Freedman offers hundreds of tips and insights that can help you figure out your own answers. About the author: Joshua Freedman is the author of three books: Inside Change, At the Heart of Leadership: How to Get Results with Emotional Intelligence, as well as The Vital Organization. Joshua Freedman was born in Berkeley, California and attended the Head-Royce School in Oakland. After a stint at the University of Toronto, he graduated from the World Arts and Culture program at UCLA and went on to work at the Nueva Learning Center in California in the early 1990s. While there he worked with the emotional intelligence focused “Self Science” curriculum developed at the school. Joshua Freedman leads the world’s largest network of emotional intelligence practitioners and researchers. Six Seconds has offices and representatives in over 25 countries. Freedman is one of a handful of experts in the world with over a decade of full-time experience in the emerging field of EQ.